A relatively hardy fish that will usually eat all kinds of food. It gets to about 6 inches or so and at that time it starts to develop the yellow in the body and near the head. It needs sand as it will drive into it at night. 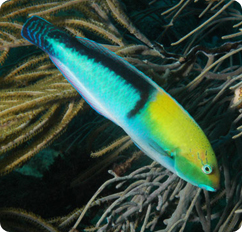 Care needs to be taken when mixing with other wrasse, otherwise it does well with most fish as long as they’re not too aggressive.